In previous posts on this subject, I focused on finding a publisher, finding an agent and finding your voice as an author. In this post, I will be looking into the technical details of one of the most important contributors to finding a publisher and finding an agent – getting reviews, one of the first inputs into your sales funnel. “Oh, meh”, you say. Read on, though. This is interesting stuff. You’ll meet Nofu, Tofu, Mofu and Bofu, the Four Brothers Buksalesnikov. A great deal of the success of anything depends on how it is marketed. A book is a product, like anything else that’s sold. Yes, it is an art product, but it is, nevertheless, a product that is created to be used and shared. (Which again raises the question of how meaningful the Future Library Project is – considering the books in it will only be read in 100 years’ time.) How many people get to do that, depends on how well the book is promoted. Reviews is one of the primary methods a writer can use to make their book look good to a potential publisher or agent. They have to get some of the reviews before the book gets published. What does a first time author have to do to get people to read and review (and buy) their book? Firstly, and primarily, like with perfume advertising, they have to get people to TRY it. After having tried it and liked it (hopefully) some readers – not all – will spread the word to other readers, and voila!, you and your book have a following. This process is part of the “sales funnel”. Book marketing and sales is a specific application of the classical “sales funnel” or “business development funnel” concept. According to the funnel concept, the sales process is like a funnel – a lot in, a little out. At the top end, you create wide awareness of your product (Hey, this book is great! ), then you promote specific engagement with your product (Read an extract! Rate this! ), then you propose a direct transaction of your product (Buy me? ), and someone buys your product (Would you like your receipt emailed or in the bag?). 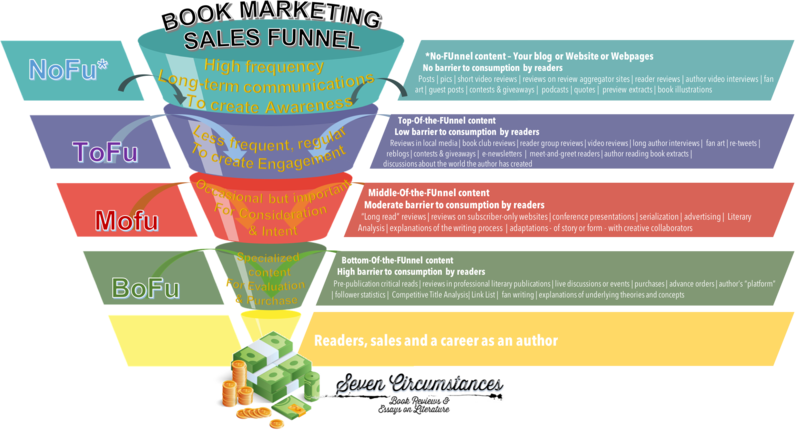 The Book Marketing Sales Funnel – The Seven Circumstances version. The idea is to create a variety of content to get someone to try your book. There’s a long process before a reader or a publisher buys a book: – awareness, followed by engagement, followed by consideration and intent, and then evaluation and purchase. In all these phases, reviews influence the potential reader quite substantially. The main idea behind the publicity side of marketing is to build a base of readers, who will talk about your book and spread it by word of mouth. The caveat on this is that, according to writer and editor Janice Hussein, “marketing pays off when it’s done consistently and over time.” Book promotions, such as reviews, the most effective form of promotion, if they are the real thing, “usually starts with local media, moves to regional, and then national.” (Janice Hussein, in Writer’s Market 2018, p.84, 85). Publicity is free editorial about your book in the media. It can be a review or an interview with the author, or the author’s opinion on an industry or genre issue. Author Jon Gliddon’s communications followed this process. Jon’s reviews, and the discussions about the book, did gain him publicity, though some focused on the local content rather than the literary value of the work itself. A warning through: If you get a review, but do nothing with it, or just let it sit on your website or the publication where it first showed up, you are not communicating! Something that stays in your head is not a communique. You have to get it out in as many places on the Internet and in the real world (wherever books are sold and readers and writers gather) as you can. That makes you and your book findable. How do reviews help an author? Have your book translated real quick and reviewed in different languages and markets – it is handy if you as an author are fluent in more than one language. Being fluent in French in Canada definitely helps, and Afrikaans in South Africa. Be super-nice to the bloggers who read what you write, and just ask politely for a review. You’ll be surprised how many will say yes to a roughly printed advance copy. On the assumption that you would, like Ruuf Wangersen and Jon Gliddon did, have your book for sale on Amazon – now the largest bookseller in the world – Packt further recommends that, along with your book reviews, you make yourself an Amazon Author Page. Goodreads and Packt both refer to the requirement to build a “fan base” or “established readership base” to provide word-of-mouth promotion and reviews, and so do publishers. What do publishers mean when they say you have to deliver proof of an established readership base? You want crazy fans? These are Justin Bieber fans chasing after his car after book signing. These numbers are pretty scary, but remember, the Internet is your Friend. A scary friend, full of Freudian Weirdness, but also your Bestie. 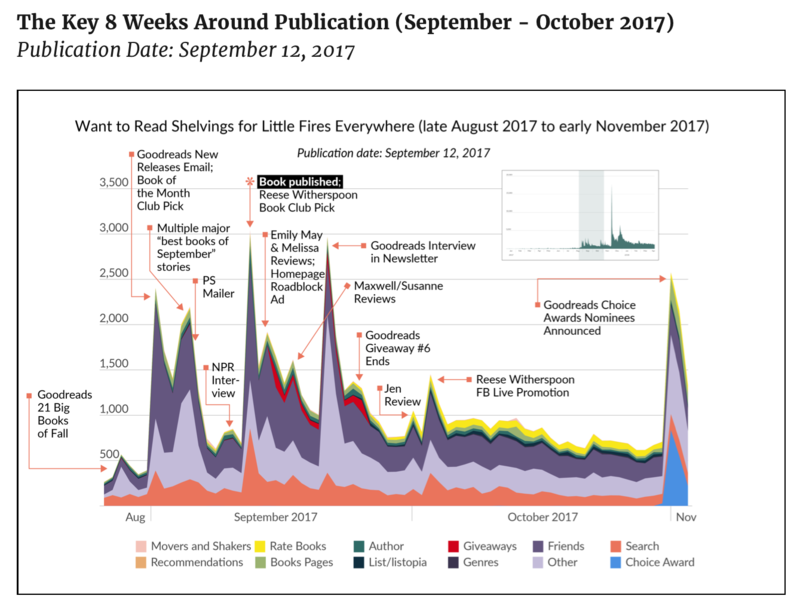 In the Goodreads case study on Celeste Ng’s Little Fires Everywhere, they describe how the reviews of the book, led to engagement and interactions of different types – interviews, emails, giveaways, live promotions, and awards – led to successful sales in the critical 8 weeks after publication. Look at the number of “followers” or “want to read” people after only 8 weeks. Ultimately, around 800 people per day were reading the book and indicating this on Goodreads. I should think Ng easily got to 100,000 fans. I find it helps if a successful author in a particular genre has read and reviewed your book, and is quoted on the book cover or in the media. The ready-made book review, written by the author or paid for by the author, can work if it is well done and balanced. That being said, it is a different matter to promote your book through “paid for” reviews, such as can be purchased on websites such as Kirkus Reviews or the subscription-based Romantic Times (RT) Review Source, which closed down in 2018. The fact that the review is paid for guarantees that it won’t be negative, and that it will be nicely written. However, it is not a strictly objective review – it does not come from that “pact of generosity” between reader and the text that develops when a reader honestly reflects on their experience. Remember also that it is not professional for your agent to ask you to pay for them to write a review, or for them to require you to buy a critique or manuscript assessment. Needless to say, fake reviews is not on. Anyone with half a brain cell can see if a review, for instance on Amazon or Rotten Tomatoes, is a fake. With professionally written reviews by authors and critics, like those published in The London Review of Books, The New York Review of Books, etc., you, as a debut author, have not a hope in hell of getting a mention. The writers in those magazines are professional writers and journalists and get paid for their work. Getting your name in there is a very long-term goal at the very bottom end of the funnel. But there are many, many readers like me who review books in a competent manner and republish those on review aggregator sites like Goodreads. Just Google them and you’ll find someone willing to give your book a read just for the sake of getting a book for free, or working with an actual author, depending on their motivations. The caveat on getting an unpaid review is that the reviewer might actually dislike your book and publish a negative review, and, as I’ve often pointed out, it’s no use moaning about it. There will always be people who you thought were in the right niche demographic for your book, but turned out not to be. So, don’t give a Sci-Fi reviewer your historical romance to review. Unless of course, they also love and review historical romances. I am a reviewer but I know my limitations. For instance I rarely read or review, family dramas, youth fiction (teen novels), and horror Sci-Fi. So, when it comes to reviews, it’s courses for horses. Advance praise really only counts if it is from someone who relates an honest and interesting reading experience. Amen to that. Can’t put it any better myself. Take his advice, dear Debut Authors. Ruuf’s novel, The Pleasure Model Repairman, is particularly niche. It is daring in subject, futuristic in concept, and written with unusually poetical flair. To find reviewers and readers, he has had to play it smart. As I explained in my previous post, the “product” you are getting reviewed and talked about is the book, and it’s you. You have to be able to expand on the comments of reviewers by explaining, or discussion, your subject, settings, voice and your process. Readers seem to find the process of writing endlessly fascinating. It’s their way of getting more out of a book that they love, by identifying with the writer. This can lead to an outbreak of Infectious Literary Tourism, with readers flocking to the place the novel is set or (worse) the home of the author. So, it’s best to sit down and word, as it were, your creative process, as part and parcel of your product. George Saunders, photo by Chloe After. “Many years ago, during a visit to Washington DC, my wife’s cousin pointed out to us a crypt on a hill and mentioned that, in 1862, while Abraham Lincoln was president, his beloved son, Willie, died, and was temporarily interred in that crypt, and that the grief-stricken Lincoln had, according to the newspapers of the day, entered the crypt ‘on several occasions’ to hold the boy’s body. An image spontaneously leapt into my mind – a melding of the Lincoln Memorial and the Pietà. I carried that image around for the next 20-odd years, too scared to try something that seemed so profound, and then finally, in 2012, noticing that I wasn’t getting any younger, not wanting to be the guy whose own gravestone would read “Afraid to Embark on Scary Artistic Project He Desperately Longed to Attempt”, decided to take a run at it, in exploratory fashion, no commitments. My novel, Lincoln in the Bardo, is the result of that attempt, and now I find myself in the familiar writerly fix of trying to talk about that process as if I were in control of it. But the point is, producing a book and having it reviewed is akin to ripping open your own chest with a sword and having your heart chomped on by a monster, who may yowl, “eh, nice heart”, or “yuck, tastes nasty”. And there you are, guts out, bleeding all over. And, well, that’s it. Have a plan. Do the funnel. Make friends with the “Four Brothers Buksalesnikov”. Or you may approach an agent. Remember, there are lists of agents and agencies in writers’ guides like Writer’s Market 2018. I thank, from the bottom of my literature-loving little heart, authors Ruuf Wangersen and Jon Gliddon for having been so kind as to let me pick their brains and for having trusted me with their candid points of view. I am gleefully anticipating their next books.